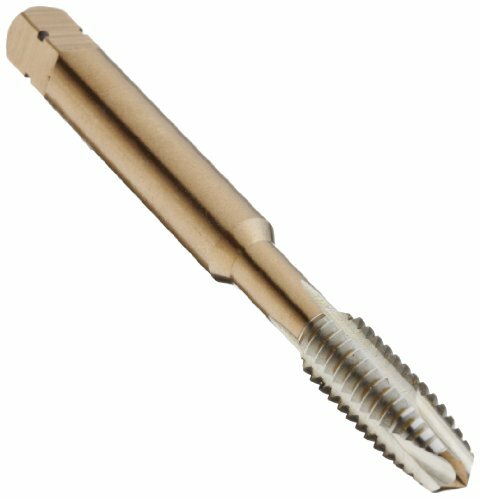 Dormer E0255/163FL Spiral Point Taps, Cobalt High Speed Steel, UNC5/16, Full Length 2.23/32", Flute Length 0.5939", Shank Diameter 0.3180"
The Dormer MTT-X E025/MTT-X E035 powdered-metal steel spiral point tap has a round shank with a square end, gold oxide finish, and a plug chamfer, and is used to create right-hand threads in a range of materials, with best performance in steel, copper, brass, aluminum, and magnesium. It is available in two different ANSI thread specification standards: UNC (Unified Coarse) and UNF (Unified Fine). The spiral point of this tap (sometimes referred to as a “gun tap”) pushes chips ahead of the tool and the straight flutes reduce clogging. Both characteristics make it suitable for threading through holes (extending through the workpiece). Gold oxide is a low-temperature heat treatment that reduces grinding stress within the tool. A plug chamfer distributes cutting to ease tapping at the beginning of the hole and to maintain correct perpendicular alignment with the workpiece. In the Dormer MTT-X E025/MTT-X E035 series, taps in machine screw sizes 6 to 12 have two flutes, taps with nominal diameters of 1/4” to 3/8” are available with two or three flutes, taps with a nominal diameter of 7/16” have three flutes, those with nominal diameters of 1/2” are available with two or three flutes, and those with nominal diameters of 9/16” to 1” have three flutes. All taps in both series have plug chamfers. This tap conforms to ANSI standards and can create threads to a depth two-and-a-half times its diameter. It is suitable for the 3B tolerance class: 3B produces close-tolerance fasteners that resist loosening, as in aerospace applications.